There is so much to say about grape pie. But rather than carry on for hours (I could, but it wouldn't be pretty), I'll offer just this: It's not easy to make. It's best to set aside most of a day to prepare it — or do the crust one evening and the filling the next day, for a total of four to six hours, including cooking time. It's an epic task. But few days are spent on a better single endeavor than producing this stunningly beautiful, absolutely delicious, one-of-a-kind, showstopper pie. Last year, I made it with Concord grapes, which I found at the Greenmarket in New York City's Union Square. This year, I searched high and low, but the one person I knew growing the deep-blue-purple fruit said his crop was spoken for. The grapes are super-tart, which makes them great for baking, since most fruit pies call for lemon juice to perk up the pucker. With these, that's not necessary, and their character, color and texture are much like the Concord's. They're smaller and seedier, so you'll need a lot more of them to fill a pie, but I enjoy their sour, feral flavor. And you won't have to pay $6 or more per pound for the cultivars, because these grapes are free for the taking, growing on a roadside near you. As with all wild forage, KNOW WHAT YOU'RE PICKING. If you're not absolutely certain what the wild grape looks like, do your homework first! 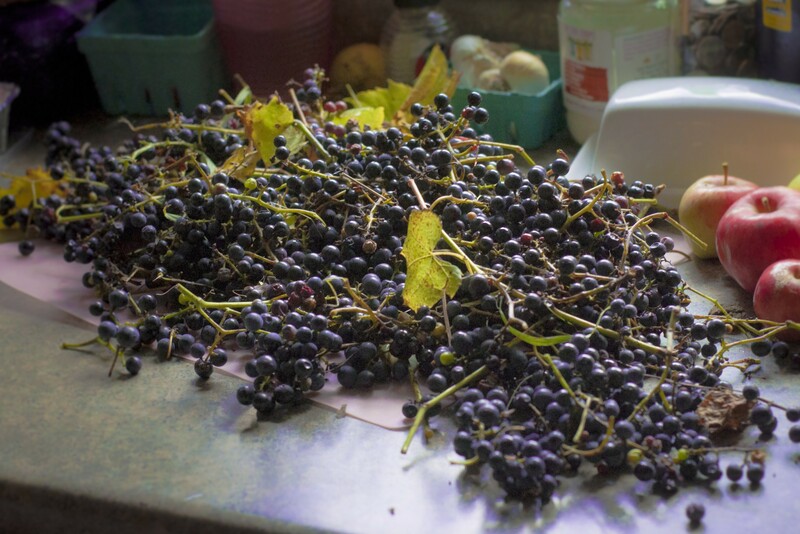 If you don't have time to go pulling wild grapes from trees, use Concords — I saw some from Massachusetts at City Market last week, and some of those may be left. *If using Concord grapes, add the juice of half a lemon and 1/2 teaspoon lemon zest to the filling mixture, and subtract 1/4 cup of the brown sugar. Make the crust well in advance and have it rolled out, refrigerated and ready to go in a buttered 10-inch pie pan (see crust recipe, below). Squeeze each grape to remove the pulp from the skins, placing the skins in a large bowl and the pulp in a medium saucepan. With wild grapes, this takes forever, as you need a lot of grapes and, as far as I can tell, you pretty much have to do it one grape at a time. Concords are bigger, so it's quicker, but still a long-term commitment. Mince the skins, return them to the bowl and set aside while you deal with the pulp. In the saucepan, heat the pulp over medium heat, simmering until the pulp breaks down into a thick liquid and starts to release the seeds, 15 to 20 minutes. Pour the pulp through a sieve into the grape-skin bowl, pushing and mashing, until only seeds remain in the sieve. Now, and only now, are you ready to preheat your oven to 400 degrees F.
Mix the sugars, arrowroot, allspice and salt into the grape mixture. Beat and add one egg. Pour the filling into the crust and arrange your lattice on top, rolling and crimping the edges as desired. Beat the other egg, adding a few tablespoons of water, and brush over the top crust. Sprinkle with Demerara sugar (be generous, as this pie is quite tart! ), place the pie on a baking sheet in the oven, and bake for 20 to 30 minutes (please, set a timer so you don't forget! ), until the crust is set and begins to brown. Reduce heat to 350 degrees and cook another 40 to 50 minutes until the filling puffs up and bubbles throughout and the crust is a deep golden brown. Remove from oven and let cool for several hours so the filling can set. If you serve it too soon after baking, the filling will be hot and runny. It's not the end of the world, but best to wait until it's cooled at least somewhat. Top with fresh whipped cream or vanilla ice cream, if you like. Pie crust is much more than a necessary evil — it can be crisp, buttery, flaky and puffy, even, if handled correctly. So if you're going to make pie, invest the time in doing the crust from scratch (it takes about an hour), and do it right. It's a little time-consuming, but so worth it. The crust's efficacy rides on the butter being cold. I cut the butter into pieces, then put it back into the fridge or freezer while I measure out the rest of the ingredients. Use a French rolling pin. If you don't have one, they're about $5 and widely available. Otherwise, a traditional rolling pin or wine bottle will suffice. 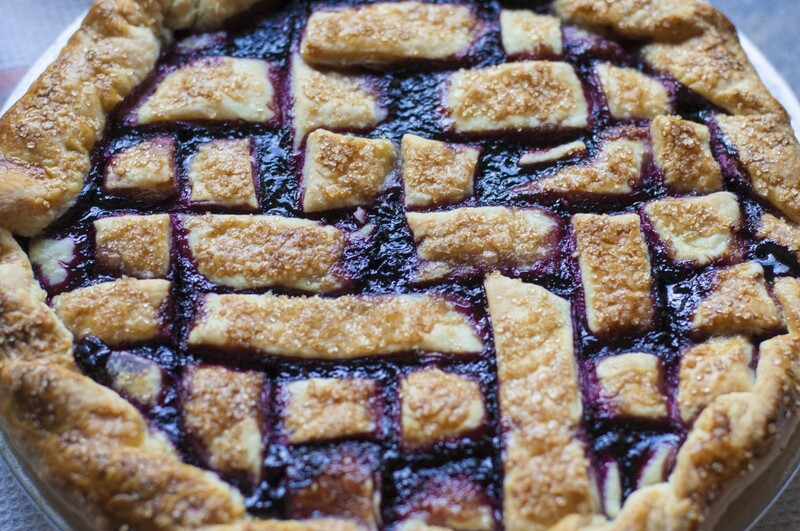 This pie calls for a lattice; these can be woven or cut out and laid on top of the pie. Don't be afraid to get creative. My crust recipe comes from a Brooklyn pie shop called Four & Twenty Blackbirds. The sisters who run it put out a cookbook about a year ago, and it's excellent. I've modified the crust just a little — using a stand-up KitchenAid mixer, among other tweaks — mostly to cut preparation time. Save this recipe; for a traditional, crusty pie, you'll never need another again. Stir the flour, salt and sugar together in a large bowl or the bowl of a stand-up mixer. Add the butter and mix until the butter is reduced to pea-to-grape-sized pieces. Combine the water, cider vinegar and ice in a large cup or small bowl. Add two tablespoons of liquid to the dry butter/flour mixture, mixing on medium speed, until all the liquid is absorbed. Add more liquid, a couple tablespoons at a time, mixing continuously, until the dough clumps together into a ball, with some dry bits remaining. Form into a flat disc (like a hockey puck), wrap in plastic or wax paper and refrigerate for at least an hour. On a floured surface, roll the dough out until it's about 1/4 inch thick all around. Place it in a buttered pan, pressing it lightly into the pan with your fingers. Leave the excess hanging free over the side. Repeat for the top; set both in the fridge to keep cool while you prepare the filling.